I grew up in Wongan Hills in the North- Eastern Wheatbelt and finished my tertiary education at Curtin University. 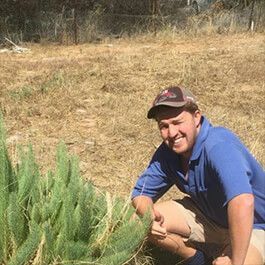 I graduated with a BSc Environmental Biology and Agriculture, which inspired me to move into doing my honours in Crop and Pasture Science at Murdoch University. Between the change in universities, I worked on various farms around the world before coming home to get a job as a technician in the Centre for Rhizobium Studies (CRS) at Murdoch University. I really enjoy the country way of life and the fulfilment of helping farmers with the application of extensive research into sustainable agriculture. After my honours I would like to be more involved with sustainable farming systems through research and development and build experience to one day complete a PhD. I believe WA is leading the world for advancements in farming systems, especially with having to adapt to the ever changing climate, so I can’t wait to be part of the future of agricultural research.